Investment Flow Chart(Establishment of New Enterprise): STEP 1.The investment inquires and provides the correlation service(Industrial Development & Investment Center ,MOEA). STEP 2.Apply for reservation of company name and business scope(Enterprise: Central Region Office, MOEA / Business firms: Local city or county government). STEP 3.Apply for Foreign Investment Approval(Please prepare the following documents to the MOEAIC: Investment Permission with Application Form A, Investor Certification, Power of Attorney etc.). STEP 4.Open a bank account in the name of the company’s preparatory office for the purpose of receiving the capital fund. STEP 5.Arrange to wire-transfer the capital fund in foreign currency to the subsidiary’s bank account and convert it to NT dollars. The company will be required to provide the bank statements of these transactions. 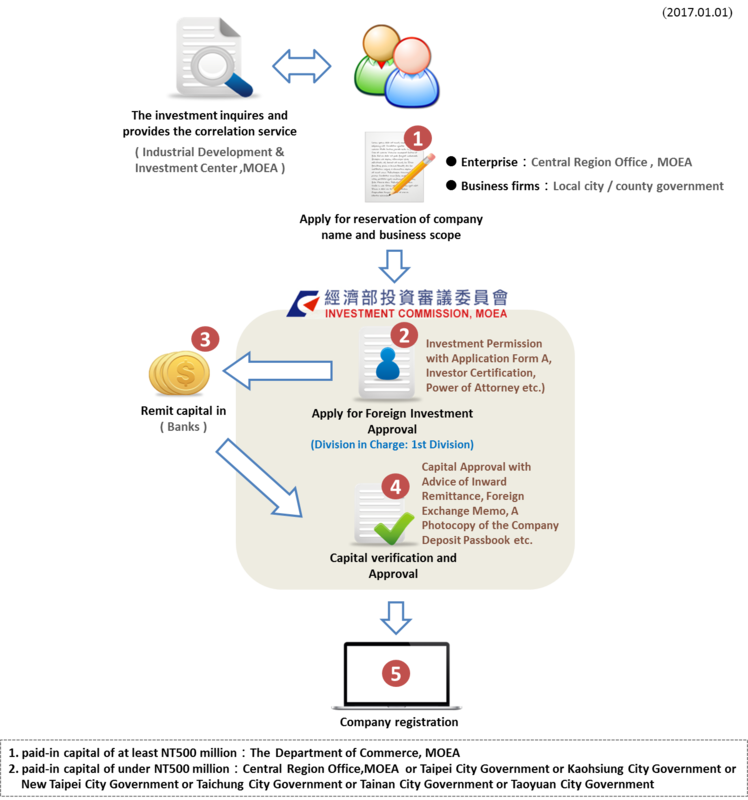 STEP 6.Capital verification and Approval(Please prepare the following documents to the MOEAIC: Capital Approval with Advice of Inward Remittance, Foreign Exchange Memo, A Photocopy of the Company Deposit Passbook etc.). STEP 7.Company registration(1. Paid-in capital of at least NT500 million: The Department of Commerce, MOEA, 2. Paid-in capital of under NT500 million: Central Region Office,MOEA or Taipei City Government or Kaohsiung City Government or New Taipei City Government or Taichung City Government or Tainan City Government or Taoyuan City Government). STEP 8.Finish. Please use tab key to choose one of page bookmarks, and then press enter key to show the bookmark's contents.